Found 4 file extension associations related to Calendar Commander and 4 file formats developed specifically for use with Calendar Commander. 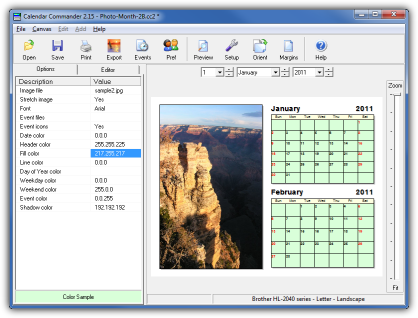 Calendar Commander is a versatile calendar printing program for Windows. Customize and print any of the many ready-to-use calendars included or design your own from scratch using the built-in editor. Include your own photos to make attractive wall calendars for yourself or as gifts for friends and family. Calendar Commander has extensive support for printing personal events and holidays and can even import schedules from Microsoft Outlook. If you need more information please contact the developers of Calendar Commander (Briggs Softworks), or check out their product website.